http://thefoolishobsession.com/tag/lush/ Emma seeing Aiden for the first time at since surgery. http://cinziamazzamakeup.com/?x=acquistare-viagra-generico-25-mg-a-Milano It has been another crazy few days in the lives of the Gehrings. 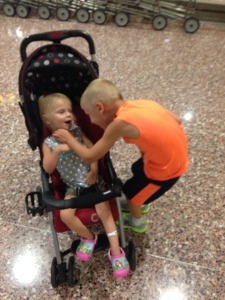 We made it safely back to Nebraska Thursday evening and thankfully Emma traveled well. It was a long day of traveling, but Emma slept through both flights and handled everything like a champ. 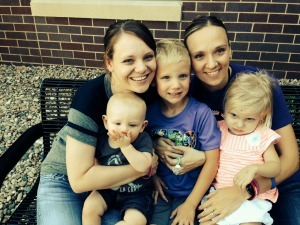 We were so happy to be home and see Aiden again. One of the hardest things about being gone for two weeks is being away from him. Emma and Aiden were so happy to see each other. We were also very happy to sleep in our own beds for a night. It had been a long two weeks of hospital living. We were so excited to see the make-over that our Carriage Hill friends did on Emma’s room while we were gone. Her room looked fantastic and Emma loved it! Emma has continued to make small improvements each day. She seems to be feeling better and her pain seems to be improving also. Emma is happier and is laughing and singing more than she has in over a month, which warms our hearts greatly. She even did some of the best supported sitting I have seen her do in over a month in her OT eval on Saturday. While progress is no where near as fast as mom and dad wish it would be, she is making progress. go here We managed to get a load of laundry done and things packed so that we could be at Madonna in Lincoln by noon on Friday. We are settled in and were happy to see many familiar faces from our last stay here. Friday was a low key day here, and we just met with a few doctors and nurses to get all of Emma’s info up to date. We were excited to find out that Emma will have the same PT and they think the same OT we had the last time we were here, and the SLP is someone Kathryn knows. She will be in good hands here with her therapists. 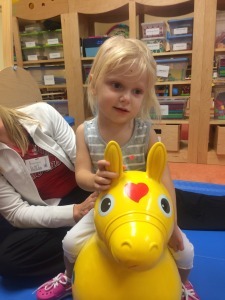 Emma had her PT, OT and speech evals done on Saturday. She was not a big fan of the PT and OT evals, but did better with speech. It is painful as a parent to watch Emma struggle so much to do things that she could do so easily just a month ago. She has quite a long road to recovery ahead of her. Emma had Sunday off, but will have a full day of therapy on Monday. Then the team here at Madonna will meet and and present us with their recommendations for length of stay and goals for Emma. 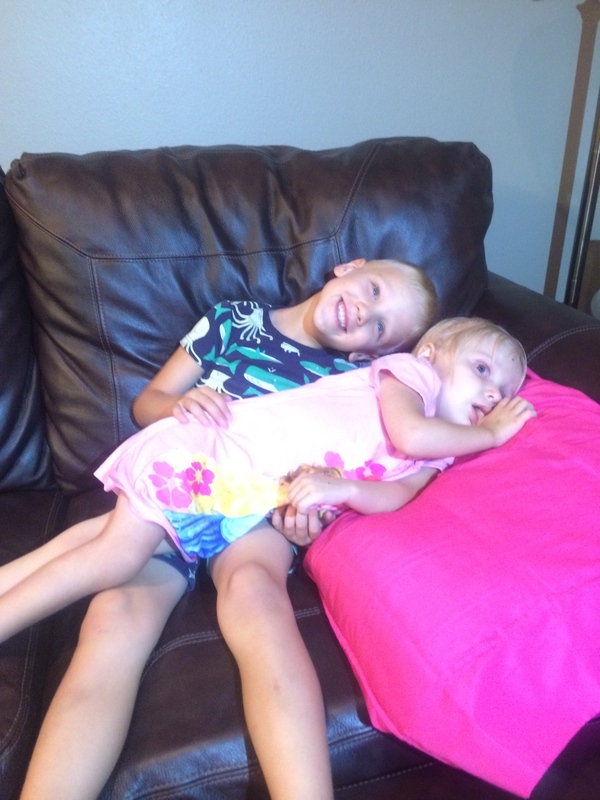 Once we find out that information we can begin working on getting a more permanent plan in place for how we are going to juggle the logistics of this stay with both of needing to continue to work and Aiden’s schedule. It is hard to imagine how we are even going to begin to make this work, but this is what Emma needs so we have to figure it out. follow site Aiden “cuddling” Emma at home on Friday morning. go site Being at Madonna is what is best for Emma, but it is going to be hard on our family. The last time we were here it was summer, which made things easier for us to be here with Emma. However, at this time we both need to continue to work to keep our health insurance and support our family. It breaks my heart to not be able to be here with Emma each day. The decisions that we have had to make over the last month seem to weigh heavily on us these days, and we only hope and pray that the ones we are making are what is going to be best for our family. The plan this week is to get Emma settled here and get Haley familiar with things here. Brent and I are both going to try to work a few days this week, and with the help of our incredibly special babysitter, Haley, we will be able to do that as she is willing to come to Lincoln and stay with Emma during the day. http://maientertainmentlaw.com/?search=risks-generic-brands-levitra-super-active As we finally have a few minutes this weekend to catch our breath, we can’t even begin to put into words how appreciative we are to each and everyone of you who continue to pray for Emma and support us. Once again, during some of the hardest days we could imagine as parents, we have been lifted up by the graciousness and generosity of so many. Our work families at Carriage Hill and Bellevue East have done more than I can even begin to explain and thank them for. We couldn’t do this without them! We are also once again overwhelmed by the support of not only people we know, but by the many people we have never met but so diligently follow Emma’s story. We cannot thank you all enough for what you do for our family. We are forever grateful. acquistare viagra online generico We want to say a special thank you to the Clarkson Public Schools, where Kathryn’s mom, Maggee works. They have been busy planning a special event for Emma. 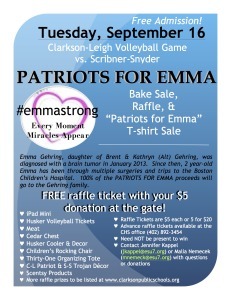 They are planning a special event called Patriots for Emma on Tuesday, September 16th. The event will be held at the Clarkson-Leigh vs. Scrbner-Snyder volleyball game at Clarkson. The event offers free admission to the game, and a $5 goodwill donation at the gate will earn you a raffle ticket. The staff there have put together an amazing list of items for the raffle and will be selling raffle tickets prior to the game as well as at the game. We have many followers in this area, so if you are in the area that night please consider checking out this great event. We are moved beyond words by the support that students and staff at Clarkson have given our family! 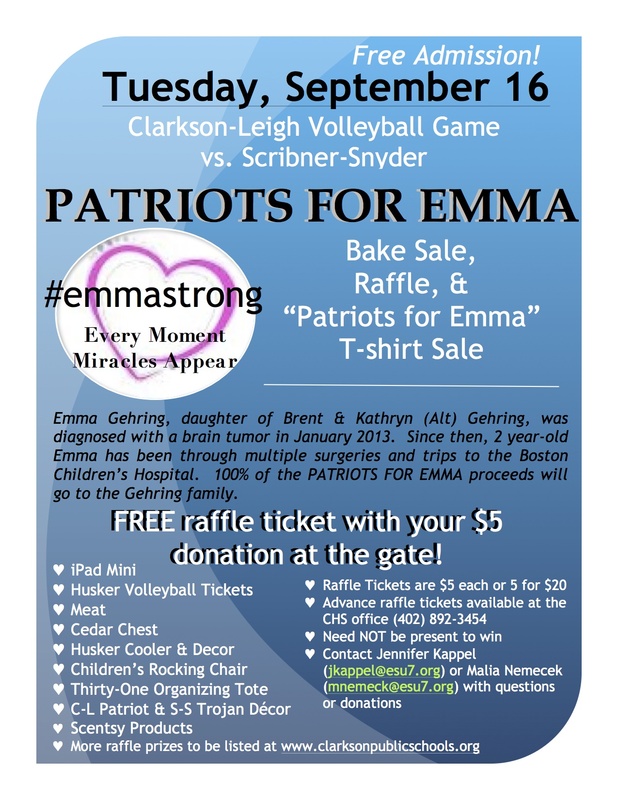 source url Flyer for the #EmmaStrong event September 16th in Clarkson. Please consider taking the time to attend. Too many prizes to list. see We didn’t expect to be back in Nebraska by this weekend, but it ended up working out great because Saturday was the Husker Brain Tumor Awareness Game. We had planned on going to this great event, but when we found out about Emma needing surgery we didn’t think we would be back to attend. We went to the brain tumor awareness game last year and it was such a wonderful event, that we were sad to miss it. However, since we ended coming back sooner than we thought, Brent, Aiden and Brent’s parents were able to attend to represent EmmaStrong. Since Emma had evals Saturday, Kathryn stayed with her at Madonna, but we were so thankful that some of our family was able to attend. 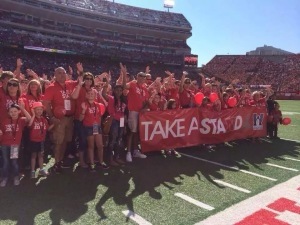 It is truly amazing how the UNL football team and the UNL Uplifting Athletes chapter has taken on the cause and done so much to help raise awareness. Through different events like these over the last year we have had the privilege of meeting several different players, coaches and other UNL life skills staff members. We are so thankful for all they do and have been so impressed by the quality players and staff that represent UNL. Days like these make us extremely proud to be Husker fans. generic viagra drugs computation Roughly 30 families from the region that are dealing or have dealt with the difficulties of Pediatric Brain Tumors. Thank you UNL and their chapter of Uplifting Athletes. 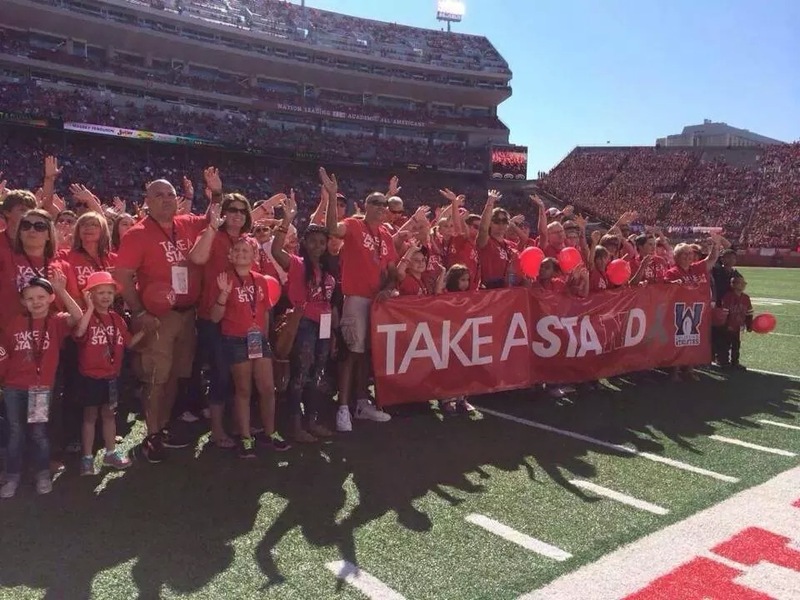 enter Without the support that the UNL football team has given, it wouldn’t be possible for awareness for pediatric brain tumors to have spread across Husker Nation. Before the game all of the families at the game were recognized on the field, and what amazing support they were shown by our amazing Husker fans. The support that Husker Nation gives this cause is truly amazing! This day not only allows for continued awareness to be raised for this horrible disease, but also allows us a chance to visit with other families going through the same thing. This weekend there was 130 members of families effected by brain tumors at the game. For a disease that is considered rare, it seems crazy to me that so many people for right here in this area are effected by this horrible disease. It is such an emotional day. Team Jack and Chez Hay in Lincoln also held a tailgate after the game that allowed for all of the families to get together and talk after the game. What a wonderful afternoon! It is so emotional to hear each families story about their journey. Each story is different, but yet as you sit and listen to each one you have the same knot in your stomach and many times tears running down your cheeks because you feel how much they hurt too. We are one of the lucky families. We still have our Emma and she is still fighting like crazy to beat this tumor. Many of the families there this weekend are not as lucky, and this is yet another reminder of why we must continue to raise awareness and fight for a cure. Kathryn got a chance to go to the tailgate, and we were all very thankful to have a chance to visit with these amazing families. You just had to look around the room at the kids and families there and you could see some of the strongest people you could ever imagine meeting. After the month we have had, it was so good to be around this family of friends who truly understands this journey. It was good for our souls. We are so thankful that we could meet some new families, and had time to visit with others that we haven’t seen for awhile. This group of families is like its own little family and is such an amazing support system for us. We were also very thankful that a few very special friends surprised us and stopped to visit Emma at Madonna after the tailgate party since Emma wasn’t able to go the game or tailgate. Emma’s friend Sage Fisher and her family (Prayers for Sage, No One Fights Alone on Facebook) who we met when we were both here at Madonna a year ago stopped by. 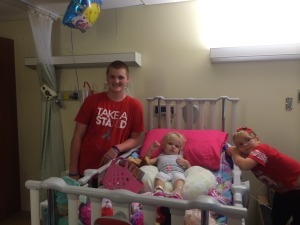 We loved getting to know Sage and her family while we were both at Madonna and are so happy to see her doing well. Say a few extra prayers for Sage today as she is at Mayo having MRI scans done. Seth Ostrander and his parents (Seth is SO Strong on Facebook) also stopped by. Seth and Emma both did chemo together on Tuesdays and Seth has always been so sweet to Emma. Emma was so very happy to see both of her friends and we were so thankful to both families for taking the time to come see us. It is visits like this or the visits from the Hoffman family in Boston that show you how special the bonds are that these kids build with each other. To see these kids play together and the way they look at each other tells a story that only they understand. They really are just the most amazing and strongest kids you will ever meet! Emma, Seth and Sage hanging out after the Nebraska football game Saturday. Thanks for coming to visit. Sorry for the long post today. We are praying this week that we can get the logistics of this Madonna thing figured out and that Emma continues to show small improvements each day. We thank you for staying EmmaStrong with us and for all of your support!